Tsugunaga Momoko: Morning Musume。´15's Suzuki Kanon-chan ♥ It's such a surprise to see her showing off her body is a surprise!! She's worthy of respect from this Momochi, who's completely full of things I won't let people see! Tokunaga Chinami: Sayashi Riho. If anything, watching her at concert rehearsals, she's really good at dancing. Her dancing draws your eyes in, I envy her. 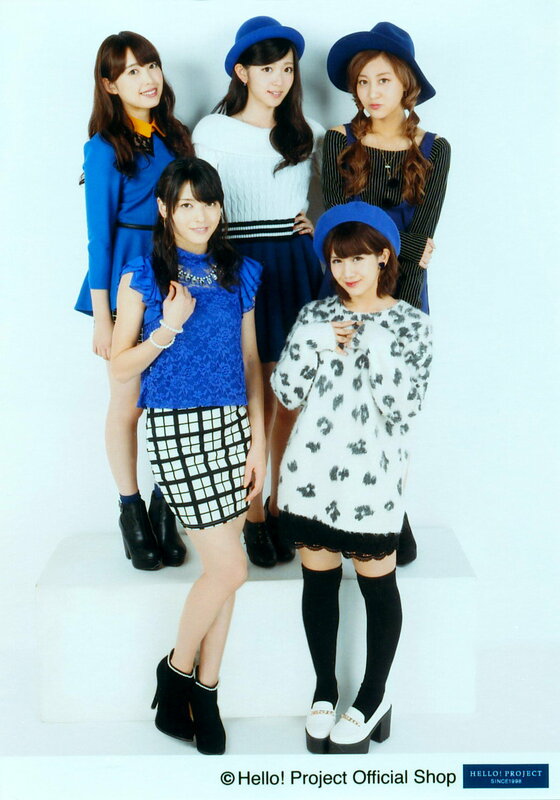 Kumai Yurina: The new members of Morning Musume。´15 and ANGERME. They're young and powerful, so I'm interested in finding out what sort of personalities these girls have. Sugaya Risako: S/mileage!!! They've upped the number of members & changed their name...... I'm really interested in what'll happen after this, and I'm keeping an eye on them! Yajima Maimi: Sasaki Rikako-chan ♥ Ever since she participated in a ℃-ute tour as a H!P Kenshuusei, I've noticed her eye-drawing presence~♥ But she's a real hard-worker with an inquisitive mind, and when we all went out for meals, each and every action of hers was adorable, and personally, the way she cries hits my spot! Nakajima Saki: Ishida Ayumi-chan. I really like Ishida-chan's dancing in 'Toki wo Koe Sora wo Koe'! It's beautiful!!! Suzuki Airi: Kudo Haruka-chan ^_^ In the midst of her frankness, you get glimpses of her girlishness as well as her cuteness that's reminiscent of a young boy...... That difference was deceiving in 2014. Personally, I like her dancing. Hagiwara Mai: Kudo-chan's cute. Looking at her photos, it's like OMG~. Fukumura Mizuki: Buono!-san. I think that it was nice to see them in 2015 too, seeing the sight of them sing at the 10th and 11th September Budokan concerts and at France! Sayashi Riho: Iikubo Haruna-chan. You've become really pretty in a year's time! There are lots of scenes that make my heart skip a beat when I'm watching you on-stage. Also, you're really dependable when it comes to talking! Suzuki Kanon: ANGERME's Takeuchi Akari-chan and Katsuta Rina-chan. When we got to act in a stage-play together, we got really friendly, so I'm interested for when our groups will work together next. Ishida Ayumi: The Takeuchi Akari-san and Katsuta Rina-san combi. We became good friends through the play 'Lilium' and can speak our minds, plus they were super-duper funny, I'd like to bring in Suzuki Kanon-san and have an event with the 4 of us! We're currently in the middle of making plans to hang out in our private time. Kudo Haruka: Shimizu Saki-san. She's really affectionate with me, and her dancing is what I want to see the most~. Shimizu-san's dancing is No. 1 in H!P!! She's seriously cool. Oda Sakura: Hagiwara Mai-san! She changed her hair colour and she changed the colour of her eyelashes. As a girl, when you look at her, her 'perfect cuteness' is to the extent that it feels good, it's really soothing! Ogata Haruna: Juice=Juice's Miyamoto Karin-san. Miyamoto-san was really attractive in 'Senobi' and 'Black Butterfly' It's like she's meeting you head-first. Nonaka Miki: Yajima Maimi-san. ℃-ute's leader, and now new H!P leader Yajima-san is always brilliant, I think she's cool!! Makino Maria: Hagiwara Mai-san. Because when I went along with them for their concert tour, she was really cute, and was kind to me. On-stage, she was cute! So cute! Dancing, singing, MC-ing, Hagiwara's wonderful at everything. Haga Akane: Wada Ayaka-san! 'Lilium' was the first time I saw Wada-san acting, but her acting showed that she really understood what sort of girl Snow was, it was cool. Wada Ayaka: Kudo Haruka-chan. Since we got to perform together for the play 'Lilium'!!! Fukuda Kanon: Kumai Yurina-san. It's not just this year, I'm interested in her year after year. There might not be a day when she's not on my mind. Nakanishi Kana: Haga Akane-chan and Aikawa Maho-chan. We became friends at the Hello! Con and had conversations together, so I love the two of them. They're kind. Takeuchi Akari: Ishida Ayumi-chan, Suzuki Kanon-chan. Through the play 'Lilium', I became friends with them and my impression of them changed immediately. Katsuta Rina: Suzuki Kanon-chan and Ishida Ayumi-chan ♥ We performed together in 'LILIUM', and we were constantly together in our roles, but it really was so much fun! Since we haven't hung out together again, I'd like to try hanging out in the future. Tamura Meimi: Kananan, Take-chan, Rinapu~, the 2ki members. Their mental strength is really something!!! I'd like to follow their example. Murota Mizuki: Okai Chisato-san. Because she's really funny as an MC. Aikawa Maho: Sato Masaki-san. Because her voice is deep and impactful, and she's really funny when she appears on variety shows. Sasaki Rikako: Kudo Haruka-san, Katsuta Rina-san, Takagi Sayuki-san. Because they're cute and good at singing. Miyazaki Yuka: Michishige Sayumi-san. Now that she's graduated, it makes me want to see her even more, but it felt like Michishige-san really thought deeply about the fans. She also kept her eyes on the members, she was such a lovely leader. Kanazawa Tomoko: Ishida Ayumi-san. I really like her dancing ♥ At Hello! Project concerts, my eyes inadvertently head towards her. Her smug face is really lovely, so I'd like to watch her lots from now on as well. Takagi Sayuki: Hagiwara Mai-san. Watching her perform 'Kokoro no Sakebi wo Uta ni Shitemita' from the cheering seats at the Hello! Cons, it made my heart skip a beat! Miyamoto Karin: Makino Maria-chan! She's really energetic and her power is amazing. Although there are things about her that I think are similar to myself, I'd like to do my best to not lose to her in power! Uemura Akari: Iikubo Haruna-san. I heard that she was good at talking, but when I've tried talking with her, I don't really get it...... I'd like to talk with her at length, not just for a minute. Yamaki Risa: Takagi Sayuki-san. She's good at singing and dancing, so I really like Takagi-san's performances. She contacted me when I was chosen for Country Girls, she's a really kind person! Inaba Manaka: Takeuchi Akari-san. When she performed at the summer Hello! Project concerts, looking at her recent performances, you can really feel her charm!! Morito Chisaki: Michishige Sayumi-san. Her graduation announcement in spring was a big surprise. That was really sad. Shimamura Uta: Tsugunaga Momoko-san. I think that society's legs gave way when she joined Country Girls. You'd expect nothing less. 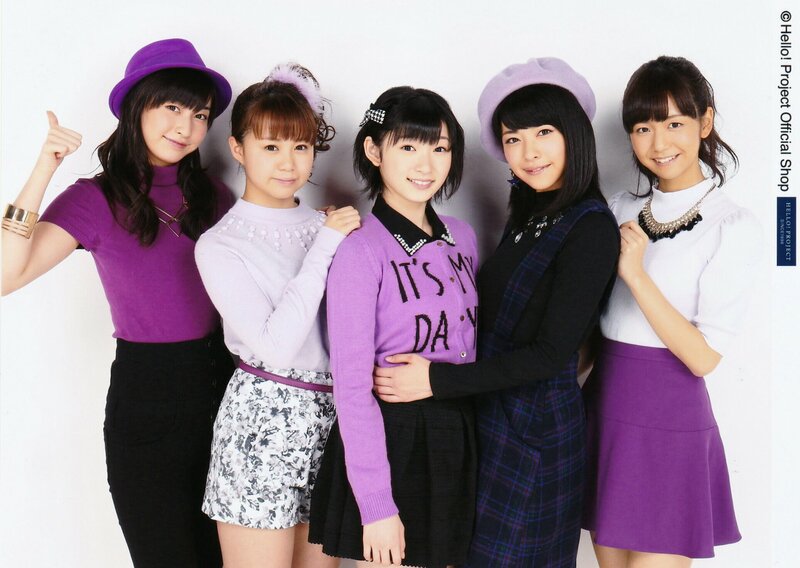 Ozeki Mai: Morning Musume。´15's Ikuta Erina-san! Watching her on variety programmes, Ikuta-san was really funny, I wanted to meet her! The loop between the 4-person Lilium group, Take x Ishida x Rina x Zukki, make up the core of the diagram. 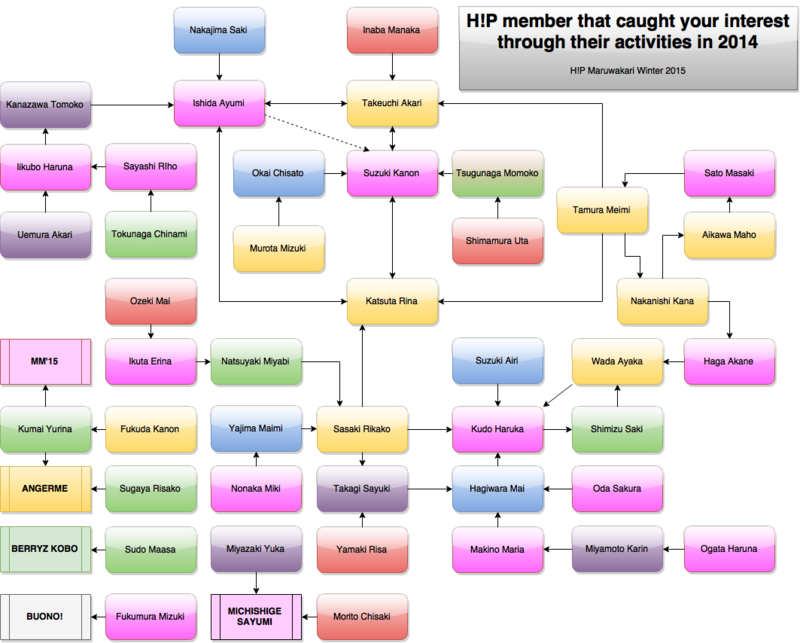 Other loops include Kudo-Wada-Shimizu and Nakanishi-Aikawa-Sato-Meimi. For the sake of neatness, groups were given a representation of their own, on the bottome-left side. Sayu was also mentioned twice. Members of the Take x Ishida x Rina x Zukki group were mentioned at least 4 times, partly by one another. If you count Ayumi's offhand mention of Zukki, that'd make 5 mentions for her. Besides the people in that group, Duu got mentioned 4 times and MaiMai got mentioned 3 times. Nice work on that chart. Do you have any insight on what "quite the S" means? The term used is 'do-S' (ドS), where the 'S' comes from 'Sadistic' - as opposed to 'do-M' (ドM), 'M' for 'masochist'. I hesitate to use the full words since the connotation in the Western world is a bit more... sexualised(? ), but that's where it comes from. The most level headed discussion of those terms I could find comes from this reddit thread, so try giving it a look. Or just try looking up "ドS meaning" in a search engine, there are a few other discussions about it.